Jimmyrigs, I see that you have the Traxxas jato front arms on your Pede. Did they need any modification to fit? Also, what did you do for the driveshafts? Those look like the RPM wide mod a-arms. Basically you put the RPM wide front a-arms on the front of the truck, use Emaxx turnbuckles (I forget which ones) for your new steering links, and your old steering links become your new camber links. Finish it off with Stampede 4x4 (wide offset) tires all the way around. Last edited by RC_N3RD; 03-21-2019 at 07:43 PM. RC N3RD is right I have the RPM wide arms up front and rpm’s rear arms. I didn’t go with the suggested toe links though and can’t remember which ones I have. I tried the suggested part just the steel not the titanium and broke one in about 5 minutes. LHS didn’t have the suggested part in titanium so I went to the next size up can’t remember which though. 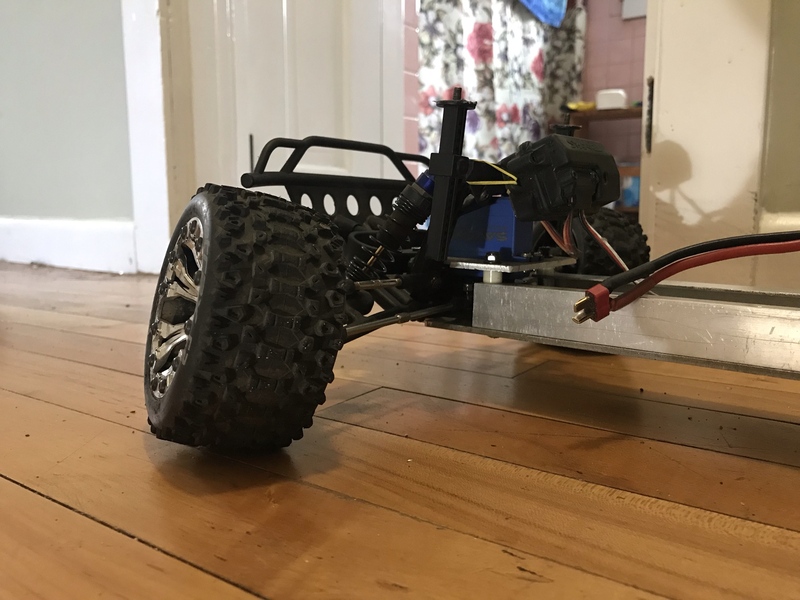 For driveshafts I grabbed some 4x4 pede shafts and seem to be working fine so far. Grabbed some 2.2” gladiator 2’s and mounted them up on a set of 2.8 rims, end up being pretty close to same size as the 2.8 six packs on the front. Truck liked it quite a bit, just ran it about 10 minutes on a tight little circle track at my friends was able to rip around it much quicker than before. It’s raining today so that might have helped. Last edited by Jimmyrigs; 03-22-2019 at 01:49 PM. I tried the suggested part just the steel not the titanium and broke one in about 5 minutes. LHS didn’t have the suggested part in titanium so I went to the next size up can’t remember which though. For driveshafts I grabbed some 4x4 pede shafts and seem to be working fine so far. How'd you break E-maxx turnbuckles on a Pede? Dad has beaten up every part of his steering except those turn buckles. He's been through metal gears, aluminum servo savers, and servo cases. Didn’t even run it 5 minutes when I barely clipped a picket fence. Wasn’t a hard hit at all certainly should not have broken the part, I was thinking maybe a defective part. Since upgrading though I’ve hit things much harder and they have held up. I did break my kimbrough servo saver finally, pretty good speed and buried it into a pile of brush. Trying the hot-racing aluminum now, if it keeps loosening up I’ll go back to a kimbrough it really took a good deal of abuse. Haven’t had much time to jump on here or run it this past week nice weather is almost here so I’ve been working on the full scale toy. Yeah, Dad's done quite a bit of abuse to his wide modded Pede, and the Emaxx turnbuckles are totally fine. I think yours must have been defective or something. He also tried a Kimbrough servo saver and it broke about as fast as the stock. He uses an aluminum servo saver with a metal geared servo now. I would definitely not go with an aluminum servo saver if you have plastic geared servo though. It'll just shred those plastic gears. Yea other than the brushless and Lipo the savox metal gear servo was my most noticeable upgrade. Nothing crazy either just the sw-0231mg, a little tall but a tiny bit of clearancing on the shock tower top and bottom and it fit nice. I didn’t use the kimbrough I seen recommended on here the guy at the lhs suggested the Kim201. Haven’t had much time to run it since putting the aluminum on, been to rainy and muddy, and I’ve been to busy soon though. Trying to find a nice spot where I have the room to really have fun. Well I spoke to soon, knocked one of the gears apart in the servo yesterday, and cracked the chassis just behind the servo, log 1 stampede 0. Had a piece of 1/8” aluminum sheet given to me today so for now I’m going to make a chassis out of that. Going to go a little shorter on the wheel base and flip that transmission around. Just way to much weight behind the rear wheels. Thinking about doing something with eyelets on the back side of the transmission to rig up an adjustment for anti squat. Was at the lhs getting the servo gears and seen the jconcept 72 Chevy c-10 scalpel speed body and had to have it. 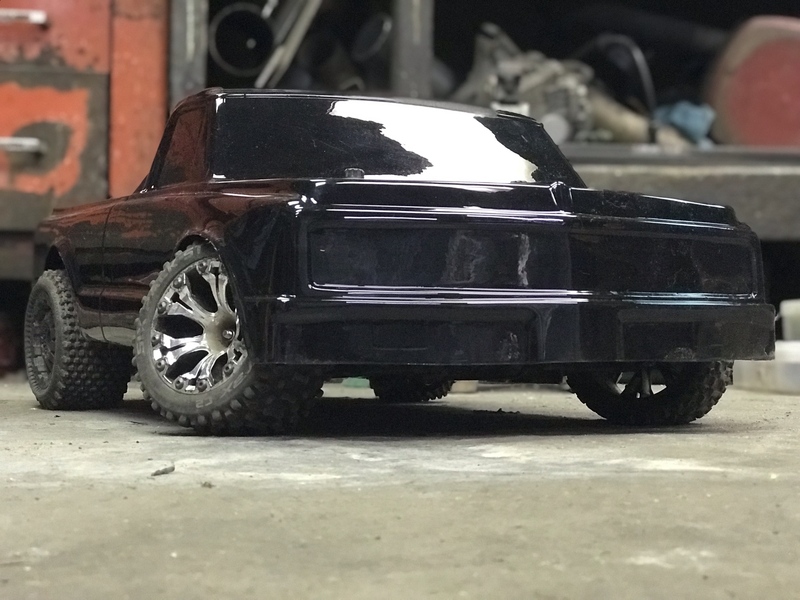 It looks incredible so I’m going to run with it and make it more for pavement, but with the ability to throw the MT tires on and bash in the dirt lightly. Measuring things out now, need some new blades for the jigsaw I’ll update as I make progress. Sounds like exactly the breakages Dad was having. I forgot, you are running an aluminum servo saver right? Unfortunately the brass gears in the inexpensive servos made today are just too weak for an aluminum servo saver. The only thing that seems to hold up for Dad right now is the Traxxas 2075x servo, but I've not had the best luck with Traxxas servos, and I've heard about 2075x burning out early, so idk how to solve this weak point on the Stampede. I guess you could dump a ton of money into the servo, but it's only a 1/10th scale 2wd, so idk if that would be worth it for most people. Anyway, let me know what you do for it next. If there is something I can recommend, put a massive T-bone bumper on the front of that truck. Really helps give it some much needed protection. Well broke it pretty good, was able to fix the servo without replacing the gears but I cracked the chassis right through the servo mounting spot. Had the back end kick out truck turned into a pretty big log and caught it with the front left. Not just once either, lol, 3 times in a row. Not really going fast just a fairly steep downhill with a slight left turn to it. With the long wheelbase and the way I stretched it it’s just too loose. Tons of weight where you don’t need it, was good and held up good to launching it, but not great with handling. I have the lower chassis made up bulkhead is mounted, and the trans is mounted reversed and it has a 13.25” wb now. Need to drill out the servo mount and cut the hole for the servo. Then on to figuring out how to link the shock tower to the side rails for some support. Well I have most of the pieces made only parts left are the supports that will connect the shock tower to the side rails. Weighed everything tonight without the body and it’s up to 5.3 pounds. Not to bad I was expecting to be a bit heavier. 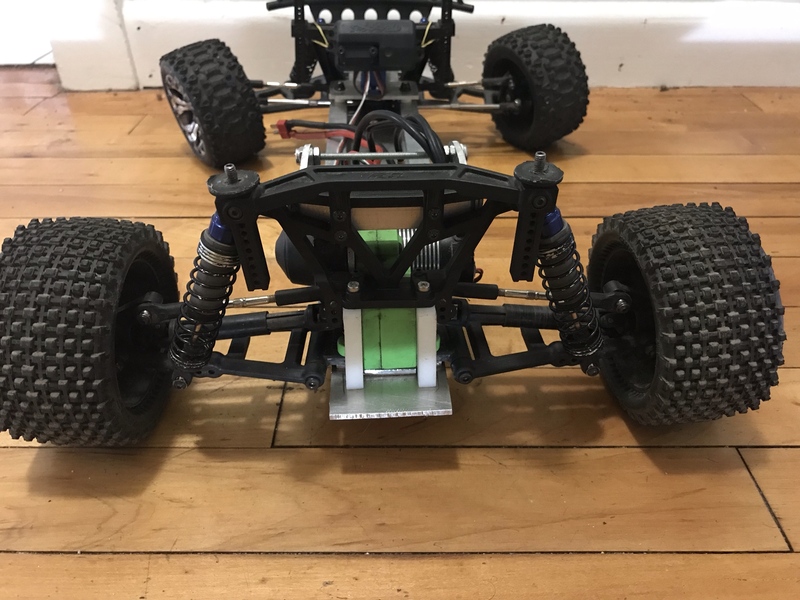 Ground clearance is is at 1 3/8” and can probably bring that up an inch by removing the shock limiters and moving where the shocks are mounted. Might be able to finish it up tomorrow I’ll post pics when I’m all done. 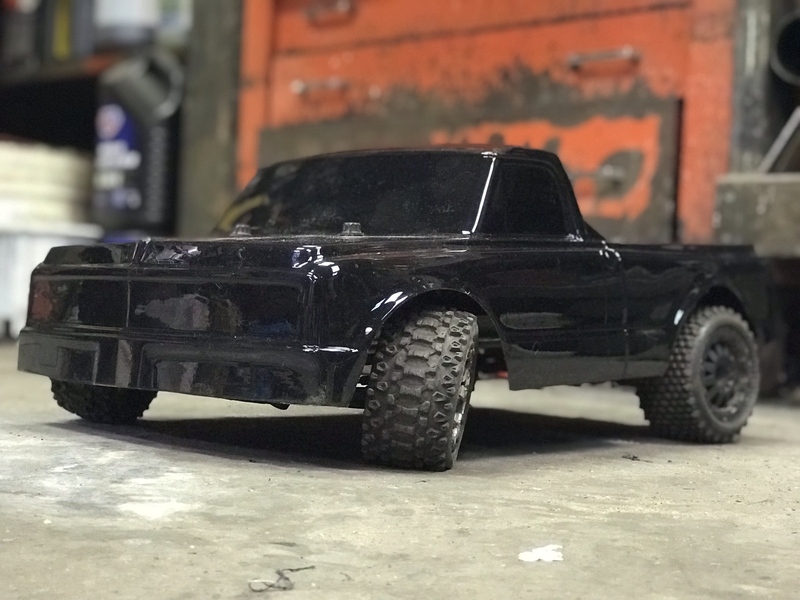 Not done yet, just some pics with the new body on. Need some decals any one know who has a decent selection of decals? Wow, that truck must be low! That body looks kind of cool though. Can't wait to see it all stickered up. All I can say is SWEET!!! At first at thought it was a slash it was so low. Looks great! 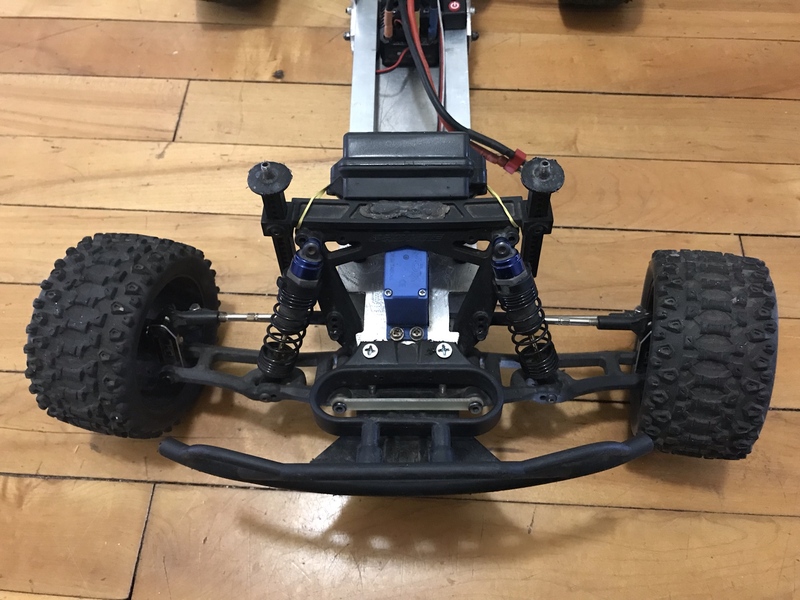 Just took it for a quick little test drive, still need to make up the supports to tie the rear shock tower it a little more. Servo is still screwed up keeps getting stuck turning one way. Thought I had it fixed guess I need to put the new gears in after all. 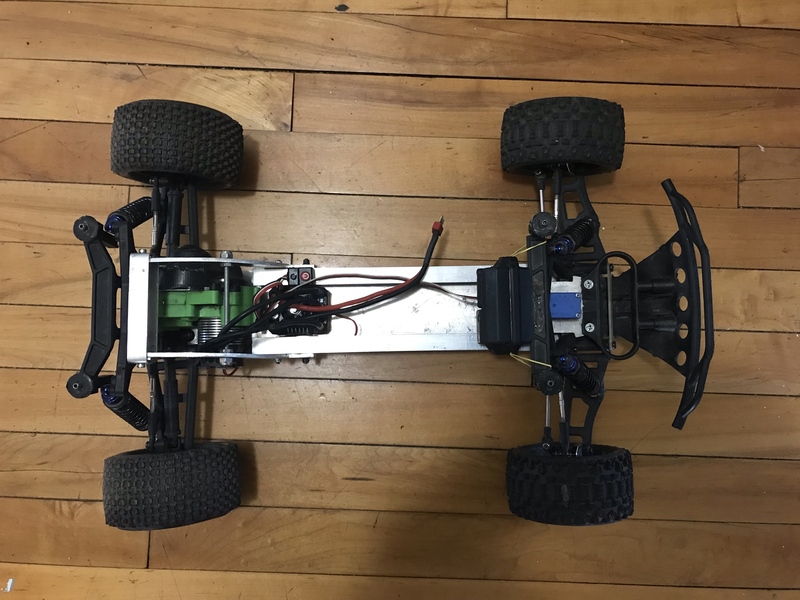 Drives in a straight line a lot better, and it turns really tight, surprised by that with the stampede chassis stretched the turning radius was insane. Guess that low roll center really helps a lot. Almost done pics are coming, it is kind of similar to one I seen on these forums, need to find that post again and be sure to give props to that person. Isn’t the internet great, lol. oh, I just realized your servo issue might not actually be the problem. Dad's Stampede, ever since he did the wide mod, has had a problem where if he turns too far and then bumps the wheels, they'd get stuck whichever way he turned. The problem was actually that the tie bar pushed too far and was straight with the steering knuckle, which essentially locks it into place. If you force the wheels back into place, it'll pop out and everything will be fine. I think I had to fix this by adjusting the tie bars a little bit. I'd make sure that's not a problem before messing with the servo gears. If it is the servo gears that are bad, you should hear the motor in it spinning as it tries to recenter the wheels. I thought that also, that maybe where I was using the longer bars it could be binding. I shortened them a couple mm’s and adjusted with no change at all. Yesterday I got to a dead spot in the servo you can hear the gears spinning but nothing happening so I must be missing some teeth on the gears. 99% done just need to fix the servo, mount the receiver, and make a battery hold down. I need to head out should be able to get a good test in today and hop back on tonight and report on how it goes. Final weigh in with battery and body is 5.98 pounds not to bad. Last edited by Jimmyrigs; 04-12-2019 at 02:50 PM. Hold down the battery with a Velcro strap. Not sure about the rpm trans case. I have the slipper pretty loose and I keep stripping the internal gears. Taking it pretty easy in an open parking lot and then that horrible noise. 3 sets of gears in a week, could it be the trans being reversed? I don’t get it, can’t manage to use it for more than 5 minutes without breaking it. Maybe to much weight for the transmission and I’m getting some flex don’t think so though I am barely heavier than the slash. Stripped it down, only wiped out the idler. The idler shaft has a ton of play on one half of the case more than enough for the idler gear to move. So now what, another rpm case or back to the traxxas? I would say just go back to traxxas. I heard someone else on the forum complaining about the stripped gears the RPM case gives you. Unless your using it for the toe in on the back, then just use a traxxas case. You should also contact RPM about this. They really need to sort this out. 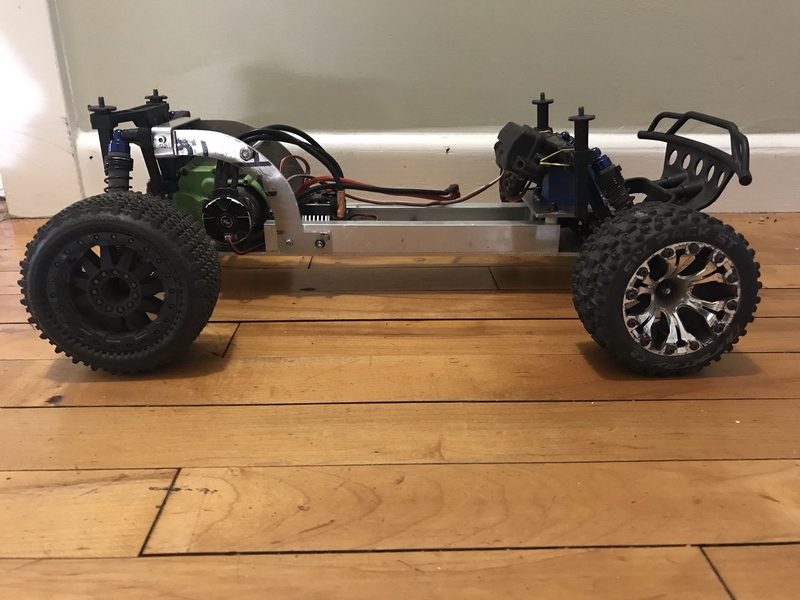 Well I went back to the traxxas transmission and finally picked up a slash HCG chassis. Found a hobby shop that isn't to far away that has a few indoor and outdoor tracks, going to see what kind of rules they run and get setup for that. The pede I'm thinking about getting back together with all the stock parts and a brushed setup and letting the kids beat on that. I measured the mounting holes for the trans on the aluminum chassis they were all square and evenly spaced but a little to wide which was pulling the trans apart, barely but enough to cause the damage. So not at all the fault of the rpm trans but the idler shaft hole was damaged on the case the last time and now has too much play to use. I have also seen a couple of other people with trouble with the RPM case but they too were running an aftermarket midmotor chassis. I'm thinking if they measured out the mounting holes they would also probably find them off. Not much at all either just a few mm's in the wrong direction, if they were to tight I think it would have been ok but not to wide. Last edited by Jimmyrigs; 04-18-2019 at 02:58 PM.